You are here: Home » Code of Practice Scheme » Who will join CECOPS? 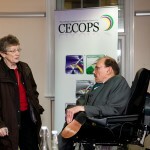 CECOPS is aimed at all organisations with a responsibility for commissioning or providing assistive technology services, including those with clinical and professional responsibilities. Clinical professional teams e.g. nurses, occupational therapists and physiotherapists.